This week something new on Japanese football in English this way comes and it is in the shape of a brand new podcast called the J-Talk podcast. It's a podcast which will mainly concentrate on the J league season but will also cover many aspects of the game in Japan including the national team. The podcast is run by Ben Maxwell, a fan of both Liverpool FC and FC Tokyo. He has been running a blog on FC Tokyo for a while now, a site which has included a fairly regular podcast on all things Gasmen known as the Gastalk podcast. At this junction, I don't know, but I am presuming Ben will continue the FC Tokyo site and podcast as I am sure English speaking fans find it very useful to keep up to date with the goings on of their team but it is also very useful to neutrals or fans of other teams who wish to find out in greater detail about one of their rivals. I certainly hope that Ben will be able to keep both going. Back to the J-Talk podcast and the very first one featured an in-depth look at the forthcoming J league season by British journalist Sean Carroll who is based in Japan and writes on Japanese football for various media outlets. I was very pleased to find that Ben and Sean took the time, the cast lasts an hour, to cover each team as I have found that quite often the lower teams barely get a mention as everyone wants to grab the glory and talk about Nagoya, Kashima, Tokyo and Gamba. 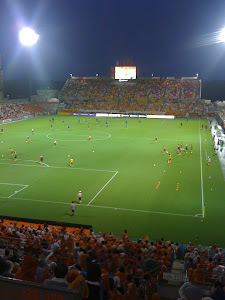 A nice mention was given to Omiya Ardija who Sean apparently feels, have done some good off-season business and might be in with a chance of a more comfortable mid-season finish as opposed to their more normal, leave it to the last moment, Houdini escape. We shall see. The podcast was handled in a very light way and the discussion was fan-friendly and I think if the podcast continues in this way, it could have an opportunity to achieve it's goals. What exactly those goals are, you would have to ask Ben himself, however I would like to see it promote the J League among English speakers of all nationalities and locations, encourage discussion and debate on the key issues of the season and spread the enjoyment and the passion of the beautiful game in Japan. This is one football fan who is very much looking forward to episode 2 of the J-Talk podcast. Be sure to check out episode 1 on jtalkpodcast.blogspot.com.